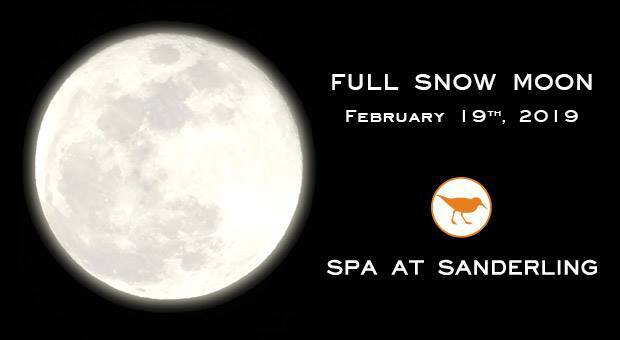 The full moon of February was first named the “Full Snow Moon” by Native American tribes. To the Native Americans, this moon represented the time when hunting and gathering were at its’ lowest point and the importance of tribe and togetherness was at its highest. Tribes would sit shoulder to shoulder around the fire in quiet reflection and gratitude. At the Spa at Sanderling on February 19th we will be enjoying this special time of year when the beach bustle is at its quietest and the Winter is at its peak with extended spa hours until 9pm. The Spa will turn the lights off leaving only the peaceful glow of candlelight and moonlight to guide us through an evening of specially curated spa treatments from the massage and bath soaks menu. Before or after your spa services, guests are encouraged to join us at the Beach House firepit for 15 minutes of quiet meditation lead by Julia Daniels. These complimentary meditation sessions start at 6:30pm, 7:30pm and 8:30pm.